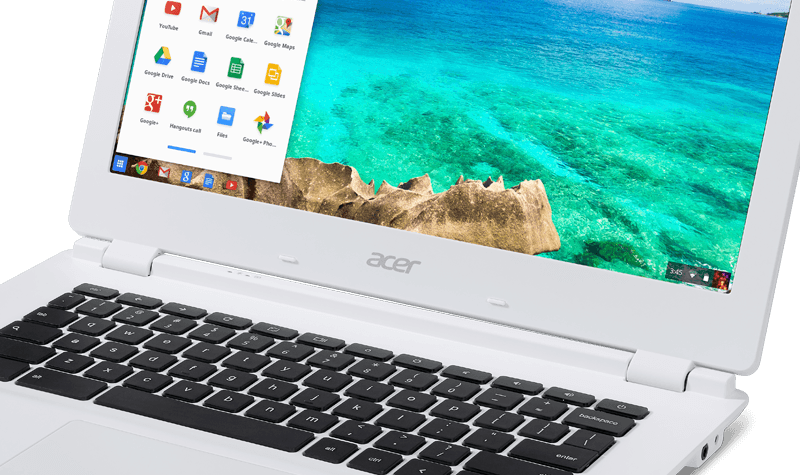 As Chromebooks’ popularity continues on the rise Acer has unveiled a new 13-inch model featuring a full HD display and the promise of up to 13 hours battery life. Based on Nvidia’s quad-core Tegra K1 chip, the Chromebook 13 will be available in four different configurations going from from $280 to $380. The base model packs 2GB of RAM and a 1366 x 768 pixel display, while the step up model moves to a 1920 x 1080 panel for just $20 more at $300. You can also opt for 4GB of RAM with the base 720p display for $330, or the full fledged 4GB RAM, 32GB storage and 1080p display model for $380. The Tegra K1 inside runs at 2.1Ghz and has an extra battery-saving core alongside the standard quad-core ARM Cortex A15 processor. This is the same chip powering Nvidia’s Shield Tablet, which can handle Unreal Engine 4, though you won’t find much gaming content to take advantage of it in Chrome OS. The laptop itself features a clean design with a matte white plastic finish, 0.7 inches thickness, and weighs in at about 3.3 pounds. The size allows for a full size keyboard, while in terms of ports and connectivity you get 802.11ac Wi-Fi, two USB 3.0, an SD card reader, HDMI output, and a headphones jack. Spec by spec, the machine will more closely rival Samsung’s Chromebook 2, which is the only other Chrome OS laptop with a 1080p display, and is powered by Exynos 5 Octa 5800 2.0 GHz processor. In terms of pricing, however, the Acer Chromebook 13 is a better value offering comparable hardware for about $100 less, or double the storage capacity at the same $380 price point. The Acer Chromebook 13 will be up for preorder starting today, with expected shipping in the US by the first week of September.